Primary testicular factors undoubtedly play an important role in the age-associated decline of Leydig cell function as indicated by a reduced absolute secretory response to stimulation with human choriogonadotropin (hCG), albeit the relative testosterone response may be normal (Harman and Tsitouras 1980; Longcope 1973; Nankin etal. 1981; Nieschlag etal. 1973; 1982; Rubens etal. 1974). A diminished testicular secretory capacity in the elderly has also been confirmed for the response to recombinant human LH following down regulation of endogenous LH with leuprolide (Mulligan etal. 2001) and for the response to prolonged stimulation of endogenous LH by a two-week pulsatile gonadotropin-releasing hormone (GnRH) infusion (Mulligan et al. 1999). This decrease in testicular reserve for testosterone secretion appears to result from a reduced number of Leydig cells (Harbitz 1973; Neaves etal. 1984; Sniffen 1950). There is, moreover, evidence for involvement of vascular changes (Sasano and Ichijo 1969;Suoranta 1971), the deficient oxygen supply inducing changes in testicular steroid metabolism (Pirke etal. 1980; Vermeulen and Deslypere 1986). In healthy community dwelling elderly men 70 years of age or older, mean testicular volume is decreased by about 30% as compared to young men (Mahmoud etal. 2003). In apparent agreement with the view of a primary testicular defect are observations of moderate increases of basal gonadotropin levels in elderly men as observed in several, but not all, studies on the age-related decline of testicular function (Tsitouras and Bulat 1995; Vermeulen 1991 for review). Although there have been some discordant findings (Mitchell etal. 1995; Urban etal. 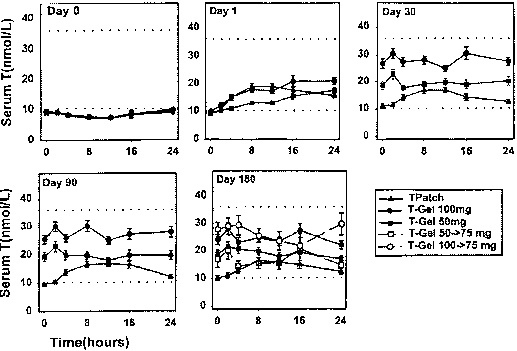 1988), this increase is not limited to immunoreactive forms of the gonadotropins, as it is also demonstrated for gonadotropin levels measured by bioassay (Kaufman etal. 1991; Matzkin etal. 1991; Tenover etal. 1988).